By 2047, the global climate will have veered drastically off course from weather as we know it, if nothing is done to curb greenhouse gas emissions. 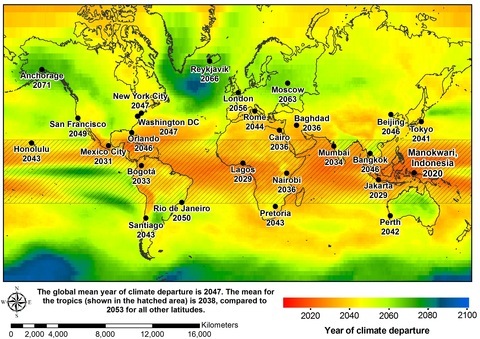 That’s according to a new study published on Wednesday in the journal Nature that predicts when worldwide temperatures will have shifted continuously outside the bounds of the most extreme records of the past 150 years. If greenhouse gas emissions are stabilized and regulated, that date may be delayed until 2069, said Camilo Mora, a data analyst at the University of Hawaii Manoa and lead author of the study. But either date, he said, is frighteningly close. Mora, co-authors Abby Frazier and Ryan Longman, and 12 of Mora’s students spent six months sifting through a massive ream of data – 1 million weather maps altogether. Data came from 39 climate models originating from 12 countries and 21 data centers, and included air temperature, ocean acidity, ocean surface temperatures, precipitation and evaporation. They relied on the minimum and maximum temperatures from 1860 through 2005 to define the bounds of climate variability for various locations. Using all this allowed them to calculate a “climate departure” year for each location. That’s when the old maximum average temperatures become the new minimum temperatures, extending beyond any climate we have experienced since 1860, Longman explained. The team illustrated their findings in a map, which you can explore in greater detail here. The report projects that the tropics will cross that threshold first. Manokwari, Indonesia, for example, is estimated to reach a new climate by 2020, and Kingston, Jamaica will do the same by 2023. This means increasing ocean acidification and sea level rise alongside rising temperatures in these areas, Longman said. The changes in climate will also place more stress on the tropical plants and wildlife. 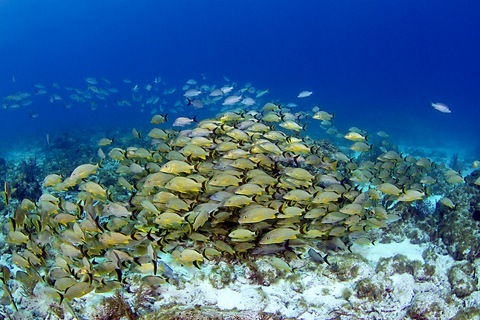 Tropical species evolved under consistent conditions, and rapid change may mean species will migrate or simply go extinct, said Philip Mote, director of the Oregon Climate Change Research Institute. It’s hard to tell which species will adapt and which will fail, but tropical species might not be able to tolerate change as well as their temperate cousins, he added. This shift in the tropics could be equally devastating to the people who live there, Mora said. Many tropical countries already have high rates of poverty and high population densities, he said; these nations may not be able invest in infrastructure to cope with a new climate. Mora was reluctant to say which climate change effects will be strongest or most prevalent at any given site. He compared it to falling from the top of a three-story ladder — you know you’ll sustain injuries, but until you hit the ground it’s impossible to say which bones you’ll break. The study comes with a five-year margin of error, give or take, for each location, Mote said. Nathan Hultman, assistant director of the Joint Global Change Research Institute, agreed, adding that droughts, floods, and other extreme weather may push these dates even closer to the present, something that isn’t accounted for in the study’s data. The study authors said they hope that projecting a date for a radically new climate will spur action and public concern.